Coloressence Satin Smooth Blusher Pink SH-4 comes in a cute round compact case with screw type transparent lid, which is easy to carry with us. 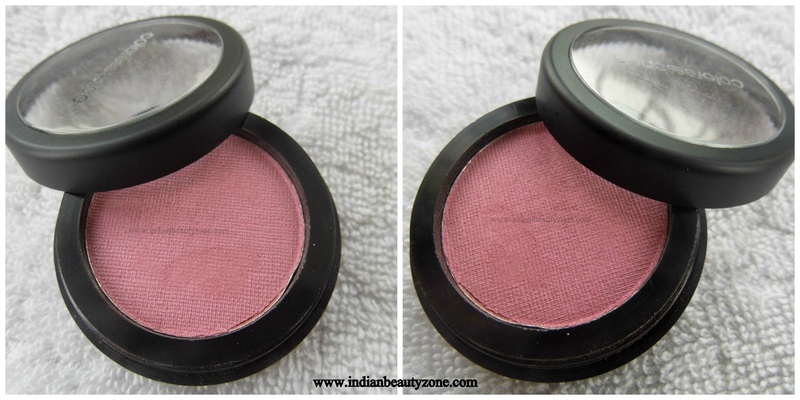 There is no annoying smell in this blush, almost nil fragrance. The shade is mentioned as pink in the package, I found it is more like mauve pink especially for medium to dusky skin tones. I have checked this blush on a fair skin tone also, for the fair skin tone it looks pretty pink and not pale. The pigmentation is very good. that it gives a good coverage and highlights the cheeks in one application. If applied too much it will give patchy look. The texture is smooth, satin & powdery almost like my colorbar blush. Almost it is like a pretty pink compact powder lols hehehe. I am loving this blush very much currently, loving the cute black round box more than the blush :-p . This blush is easy to apply, but I found it will be very easy to apply and blend properly by a blush brush than fingers. Because of it's powdery texture a blush brush is must for blending this blush. If this blush is not blended well, it will look patchy. For normal day time outings it is enough to apply a swipe to highlight the cheeks and it will looks natural. For evening outings I use to apply this blush bit extra and blend well, then it will gives a beautiful sculpted look. I love this blush texture very much because it has no shimmer and the powder texture never makes my cheeks oily or shiny. But after sometime my cheeks getting glow, I am not sure the glow is because of the blush or the foundation I am using :p.
For dry skin beauties they must need a good moisture base before applying this blush, otherwise it will looks patchy. This shade especially looks very pretty for my medium skin tone, well suitable for all skin tones. The staying power is decent for the price, it stays up to 3 to 4 hours without fading. If you use a good base for makeup this blush will stay for more time. Suitable for all Indian skin tones. 100% vegetarian, no animal ingredients. Best blush for oily skin type. Gives a matte finish which is good for oily skin, if their cheeks turns oily the blusher makes the oily look to glow look. Dry skin girls may find difficult with the texture. If not blended well may looks patchy. Availability only through online I think. Wow..seems promising for the price..do they have other shades as well? Thanks Adi, Yeah they have two shades only this pink and a peach shade, I am planning to buy that too :). Do check them. beautiful shade. Looks nice on you Radha :) I love you eyeliner flick. Thank you so much Pearl :), I just tried that eye line ;) came out well!!! Wow this shade suits u to the core. Loved it Rads. Great review!!! The color is pretty.. looks a bit powdery but the price it is really nice!! I love this shade on your cheeks Radha!!!! You just look so gorgeous!! I think this is a good option for matte finish blushes even though I am sure I would get the dewiness back because my skin is oily. Nice review Radha dear. The blush is suiting you so well and I am liking that lip color so much :) Which one? The colour looks gorgeous and quite different, and your picture is gorgeous too :D, xoxo. Is there any brush available with it? Or should we buy it separately.. ?? Wow.. Thanks for the reply Radha :) Will you suggest me this blush ? Or any other from colorbar ? 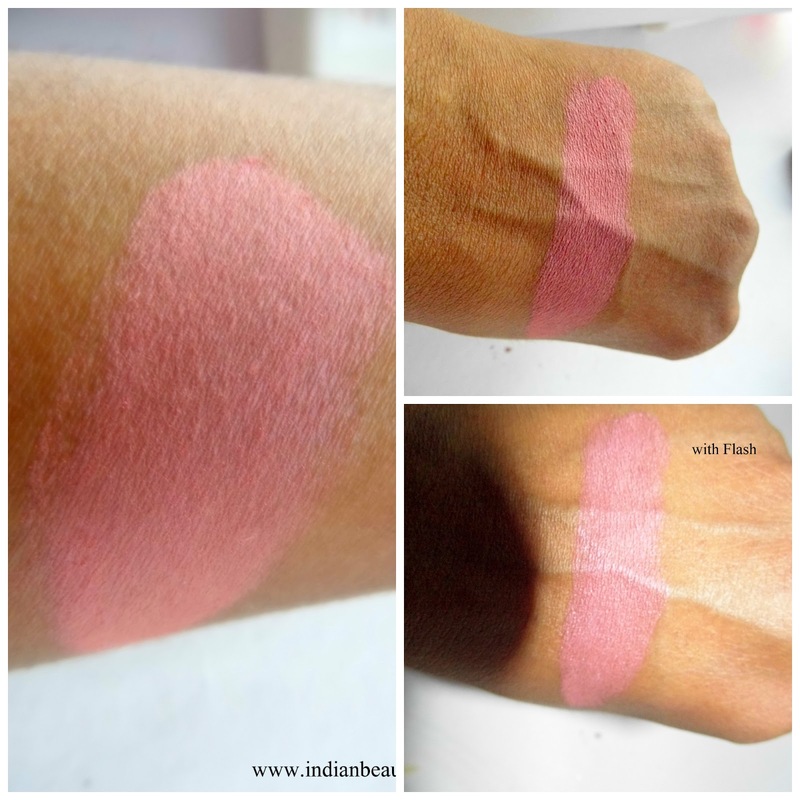 This is very good blush for the price and colorbar also good but it is 350 something, this blush is 250 rs. your choice dear.